The pelvic fins are paired fins found on the ventral (bottom) side of fish. In teleost (bony) fishes, pelvic fins placement gives some indication of evolution. For more basal groups, the pelvic fins are located at mid-body in the abdominal region. For more derived fishes, the pelvic fins are located in a thoracic or even jugular (throat) position. 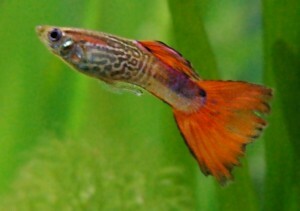 Some fish, such as Guppies (Poecilia reticulate) exhibit sexually dimorphic pelvic fins, where the males and females do not have the same fins. The pelvic fin’s first and second rays are significantly shorter on the male Guppy than the Female guppy. Research suggests that this specialization may assist with reproduction. 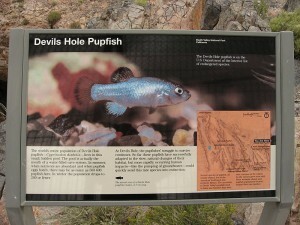 Other fish, like the Devil’s Hole Pupfish (Cyprinodon diabolis) lack pelvic fins entirely. At less than one inch long, the Devil’s Hole Pupfish is the smallest of the desert pupfish species and one of the world’s rarest species (only 65 fish were counted in a Fall 2013 survey). It is only found in one location on earth, Devil’s Hole, Nevada, and has evolved over thousands of years to survive in its harsh 93oC, low oxygen waters.